So if you read my blog - you know I'm a complete homer for NW Arkansas. I absolutely love where I live. I love all of Arkansas but I think the NW corner is an amazing place to live. It's a great quality of life, low crime (except for the Razorback football team.......ugh), low cost of living, beautiful scenery and great economy. I can't imagine living anywhere else. I live in Bentonville which I ADORE. It is home of Wal-Mart. It's still small town America but growing and booming. It's very family oriented but becoming very cultured. Thirty minutes from me is Fayetteville. I absolutely LOVE Fayetteville. It is a town with it's own unique culture. 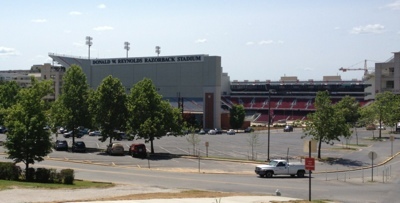 It's home to University of Arkansas - it's a great college town. It's also very artsy and very hippie. I think it's kind of a like a small Seattle meets the south. 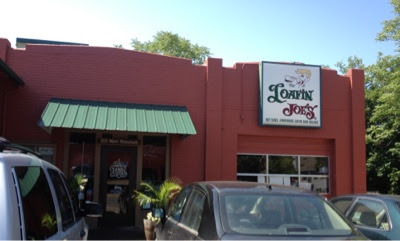 There are lots of unique shops and restaurants in Fayetteville. I don't get there enough. It's hard to drag two kids around so I don't visit often. I lived in Fayetteville for 7 years after college so it feels like home to me still. Today my Women's Bible Study gave us a free MDO (THANK YOU!!) so I was child free for five wonderful hours and I decided to do a Fayetteville Favorites day! Something I never get to do. I have a TON of favorite places in Fayetteville and I could only hit a few today but I thought I would share. A lot of you live here and know these places well or maybe some of you will visit one day! I could do a SERIES of blog posts on all the great things in NWA! 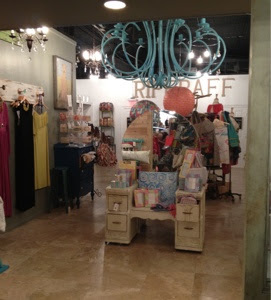 My first stop was Riffraff. 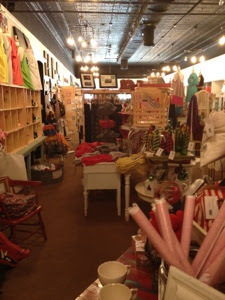 This is one of my favorite stores. It's in downtown Fayetteville on the square which is such a neat place. 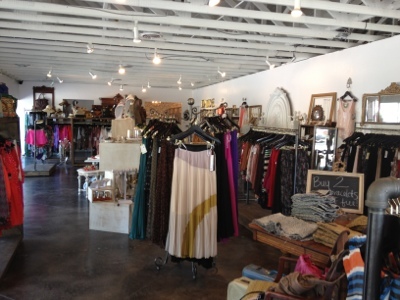 They have all kinds of CUTE clothes and jewelry and fun home stuff. It's such a unique store. I just adore it! You can shop online through their FB page! They ship clothes for a small fee! I took all pics with my phone so not great quality but so fun to look around! 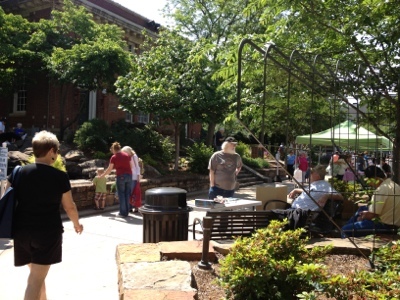 One of my FAVORITE things about Fayetteville is they have an amazing farmer's market every Saturday on the square. They also have small ones during the week and one was going on today. I also hit up this awesome boutique Maude. They have CUTE CUTE clothes. Eek! I wish I could go more often. They have a FB page you can shop on-line at too. I found a really cute Maxi skirt that I'm so EXCITED about!!!!! 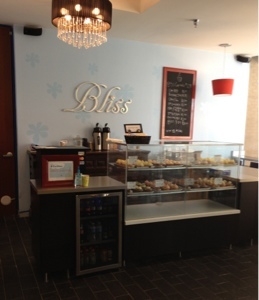 While I was on the square - I walked over to the BEST cupcake place in Arkansas - Bliss Cupcakes. 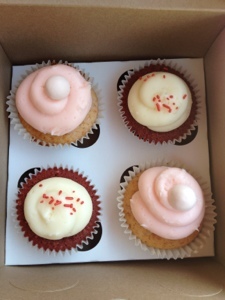 I picked up a few strawberry and red velvet cupcakes for my family. I can't wait until after dinner! SO yum! I decided to get two of my favorites that I can never have for lunch. I walked over to Loafin Joe's and got the BEST CHIPS in the world. They hand make these ranch chips and I have been obsessed for 17 years. There is a place off Dickson street called Hammontree's. They make every kind of grilled cheese sandwich you can imagine. This is the best sandwich I have ever had. 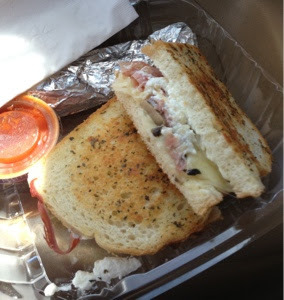 It has three of my favorite things - parmesan cheese, proscuitto, and mushrooms. I could die it is SO good. PS On a totally different note - I got an email that you can get $15 off at Paper Coterie if you use the code GIFTFAVES before midnight tonight. Make a cute picture book or calendar!